Over the past two months, my husband and I have had the chance to experience another first in the parenting world…soccer. Our very active, five year-old daughter decided she’d like to give it a try, and we were all for it! And, oh, let me tell you, friends…those sweet little kiddos playing soccer? What a kick! They learned the basics each week, and there was actually quite a bit of improvement in the two months they were together as a team. And there were also some sweet, unforgettable moments, too. There was another sweet girl who sure liked her mama and daddy because she kept running off the field to see them. Yep, during the game. Gotta love the cuteness. It was fun watching the kids play this season…a lot more fun than I thought it would be. But I have to confess something from this mama-heart. 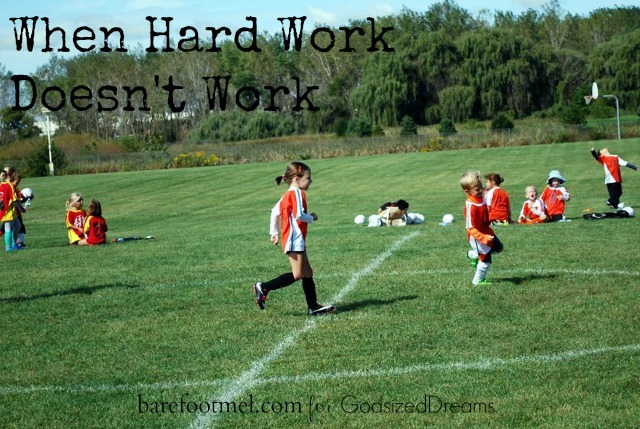 It’s tough to watch your kiddo work hard and improve and still not score a goal. That was what I prayed for this season. One goal, God? Just one? Please? And while there were moments of victory when she made a good pass or had an awesome kick, it was hard. Ever the sweetheart, I watched her cheer her heart out for her teammates…but there was a sadness. She wanted that goal. And as I watched her make her way through the season, I decided that maybe there was something she was teaching me. It was a slightly painful lesson for this girl, too, because I often think back to almost three years when I got that e-mail from my sweet, now-friend-and-sister, Holley. Congratulations! You’re a member of the God-sized Dream Team!!! And, immediately, visions of a rough draft and a book deal with a publisher and a best-seller on the shelves of Barnes & Noble began dancing in my head…and in my heart. I was so sure it would happen…And so sure it would happen right away. I was sure those literary agents would sit down, look at my chapter samples, and be like, YES. OF. COURSE. WE. WANT. YOU. It was my own soccer game, my own, I’m-going-to-work-so-hard-at-this-and-it’s-going-to-happen, moment. Why wouldn’t it just all fall into place for me? I was so willing to work, and of course, God would open the right doors. It’s not always easy to look back at that time, but I do see now the purpose He had in all of it. No, it didn’t end up quite the way I’d imagined it. I thought I’d publish a book. I tried. I wrote. I met with some wonderful agents, but it didn’t happen. And so, instead, I write. My blog (sometimes) and here and there for two sites that I love. I thought I’d be well-known. Instead, I’ve learned the value of loving and treasuring those whom God has placed in my life. I thought my dreams looked a certain way. And, instead, God has taken them and made them so wildly different…and still wonderful. Sweet dreamer friend, I know it can be hard when you dream something and your heart just wants it so badly. And maybe it’s just not happening, and you can’t understand why. And that’s why I wanted to share something with you today. Your dream might require a whole lot of work, and even some sweat and tears. And if you put all of that into it and more…and it still doesn’t happen? Know that you are loved. That there is purpose. And that you should still keep dreaming. Maybe there will be a book for me someday. I hope so. Wow! How timely this was for me on today! Thank you for your transparency & for sharing! Life is a journey — a lot of running back and forth on the field, with a lot of teamwork and helping others succeed – making their goals. Sometimes if we get lucky or if the team helps out, we’ll get our goal too. Glad to see you writing Mel!